Two people were injured in a Tuesday morning crash in the Fullerton area. 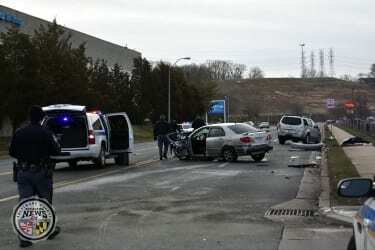 The crash occurred at just after 7 a.m. at the intersection of Belair Road and Rossville Boulevard. Upon arriving at the scene, emergency personnel found that one of the two vehicles involved had rolled over onto its side. The two people that were trapped in their vehicles were extricated and transported to the hospital, according to Baltimore County Breaking News.